If you were annoyed by the plaudits this seemingly mediocre Russia team received after their admittedly impressive, high-scoring victories over absolute joke teams like Saudi Arabia and Egypt at the start of the World Cup, then you must’ve loved seeing Uruguay bust up on the vile Ruskies in today’s 3-0 thrashing. To be fair, Russia genuinely did look pretty good in their first two matches of the tournament. They were more lively in attack than most expected, and did what a good team should do against inferior competition: crush them. However, beating up on Saudi Arabia and Egypt was never much indication of Russia’s true ability because any respectable team should be able to whip up on those guys. And seeing Russia get all chesty about their boys as if they were real contenders or something because they managed to run over a team full of players almost no one had ever even heard of in their first match was annoying, so their long-awaited comeuppance today was a treat. 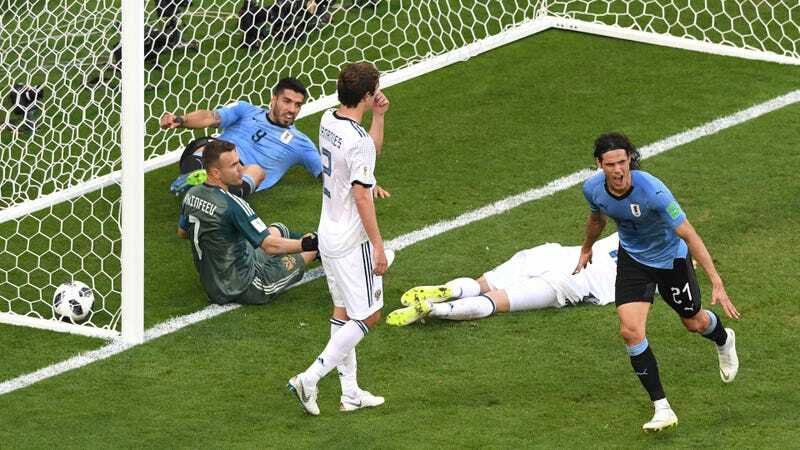 The Uruguay-Russia match was a big deal because it determined which team would finish first in the group and thus which team would most likely face either Spain or Portugal in the next round. But even more important than knockout round positioning, this match clarified in our own rankings that Russia should definitely be counted amongst the frauds. Russia Is The Highest Scoring Team In The World Cup. INVESTIGATE? !